Dingrun Chetoos production line is the use of maize (corn maize) as raw material, after the host squeeze into irregular puffed food, the taste can be made into different taste crisp products, loved by consumers. 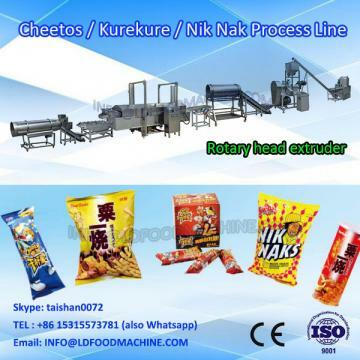 The extruder with vibration feeding hopper, and adjustable size of raw materials flow. Feed screw rotation speed controlled by frequency conversion, can be adjusted. Mechanical gear linkage, realize manual control extrusion head clearance, the handwheel control stand linkage, may make it easier for feed screw into the extruder barrel. 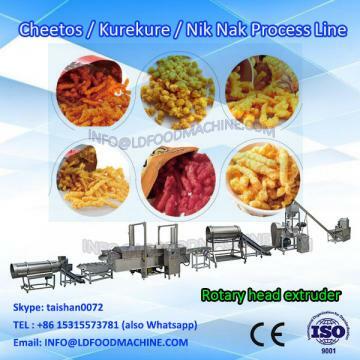 Cheeots Snacks/Corn Curls /Kurkure/Nik Nak Snacks Process Line adopts American Extrusion technology, it takes corn grits(not powder) as raw materials , through single screw rotary head extruder direclty expanding out twist corn curls. After this it will be processed with dryer or fryer to get final crispy cheetos snacks. 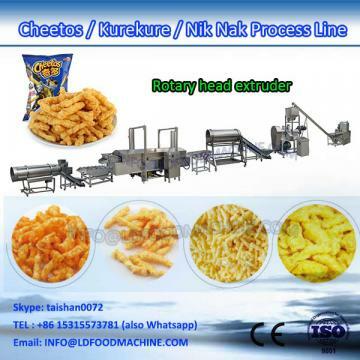 This processing line can be used to produce different sizes of kurkure snacks, the size and thickness can be adjusted . 2) Raw material: Corn Grits. Jinan Dingrun Machinery Co., Ltd. located in the City of Springs, Jinan, which specialize in R&D and manufacturing of extrusion machinery and related corollary equipment. We piece together a team of extrusion machinery experts who have worked in the industry for several decades. We follow “Science and Innovation first, management and credit as root.” as principles, insist “Quality first, practical work, integrity to others” as operation philosophy. Develop continuous improvement,pursuit of excellence in professionalism, down-to-earth, strictly regulate the enterprise standards of behavior. To ensure we provide quality service to our customers. And doing best not only in the extrusion technology research, but also continuously explore in the extrusion food, instant food, snack food, simulation process aspect, such as aquatic feed , to create a number of leading technology extrusion equipment. Dingrun company rely on the professional team of technology experts, has been committed to research and development of extrusion equipment, is a professional manufacturer of extrusion equipment. The company has many kinds of manufacturing equipment, diversified product range, the customers can do one-stop shopping of all the needed equipment. We are currently China's extrusion equipment and form a complete set of equipment is mainly specializing in the production, manufacturing, research and development. Dingrun company has the talents, resources, network, scale, and experience in the field of machinery puffing huge advantage and influence. In the company all staff's unremitting efforts to continuously enhance their market competitiveness and overall strength. Excellent product quality and perfect after-sales service.Dingrun company have won a good reputation among domestic and foreign customers in the industry. The company has sales of the extrusion equipment in China in over 20 provinces, cities, areas, and export to foreign countries in Europe: Britain, Ukraine, Belarus, Russia and Turkey; the Americas: Canada, United States, Chile, Suriname, Brazil; Africa: Brazil, Nigeria, Malaysia Malawi, Mozambique, Congo (Brazzaville), Lesotho; Asia: Myanmar, Vietnam, the Philippines, Thailand, Indonesia, Malaysia, India, Uzbekistan, Kazakhstan, Kyrgyzstan, North Korea, Afghanistan, Iran, Lebanon, Tajikistan and other countries. We know very well that the development of customer is our motivation, customer recognition of our best assessment, the customer's success is our pride. We are willing to join hands with Chinese and foreign customers, to exploit the future. A: One year(Calculated from the equipment arrives the customer’s side. ).